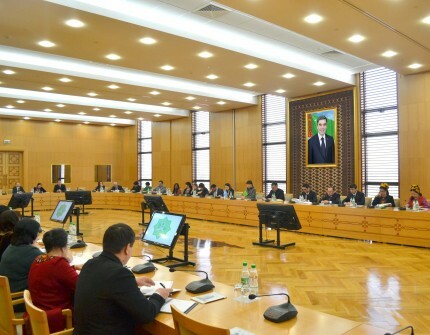 On the 8th of February 2019, Meeting of the Interdepartmental Commission on preparation of National Voluntary Review of the implementation of Sustainable Development Goals (SDGs) in Turkmenistan was held in the premises of the Ministry of Foreign Affairs of Turkmenistan. The representatives of the governing bodies of the relevant ministries and agencies of Turkmenistan, the UN Resident Coordinator in Turkmenistan as well as representatives of UN agencies participated to the meeting. The aim of the conference was to analyze the preparatory process of the National Voluntary Review of Turkmenistan on the SDGs that will be regarded during the High-Level Political Forum to be held in the UN Headquarters in New-York, in July 2019. During the meeting, it was noted that Turkmenistan is one of the leading states that realizes the objectives in the framework of the 2030 Agenda for Sustainable Development in timely and qualitative manner. It is worthwhile to note that the Agenda 2030 was adopted by world leaders in September 2015 during the UN Summit. The participants of the meeting presenting their reports on the work realized up to present moment on preparation of the National Voluntary Review of Turkmenistan on implementation of the SDGs noted that active work on implementation of relevant activities and objectives is carried out by ministries and agencies of the country. The importance of involving social organizations, experts and youth to this process was stressed.